If you’re looking for something to do in Marrakesh that takes you away from the crowds and the Moroccan heat for an hour or two, the Museum of Marrakesh is a great place to visit. Situated within the Medina, this museum is housed within the former Dar Menebhi Palace which was built towards the end of the 19th century. The palace is as much an attraction as the exhibits within the museum as it gives visitors the chance to see some of the city’s typical Andalusian architecture up close and personal including the relaxing covered atrium that was originally an open courtyard. Here hangs an impressive chandelier-type lamp that always gets everyone talking! 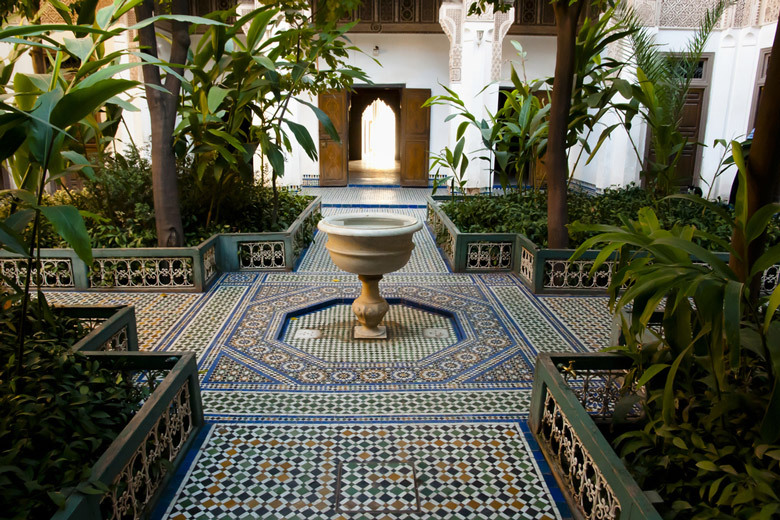 The museum features exhibits of Moroccan art, including historical pieces as well as more modern ones, and there are exhibits related to the Berber culture as well as the Arabs. The small café and shop are nice to visit too, and you may be lucky to visit on a day when the artist is creating calligraphy for visitors featuring your name in an Arabic watercolor. 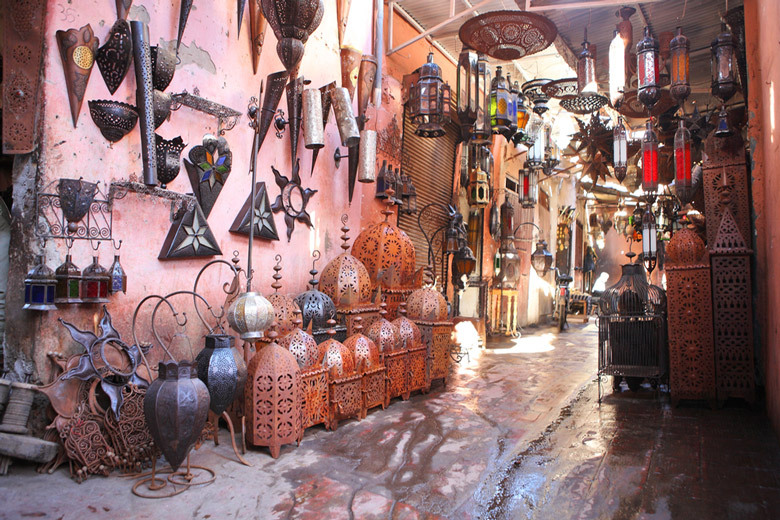 All in all, the Museum of Marrakesh is a welcome break in a busy city. As palaces go you may not at first think that El Badi Palace is anything special. After all, this once bustling palace is now largely in ruins and today it’s a popular hangout for the local populations of storks and stray cats. 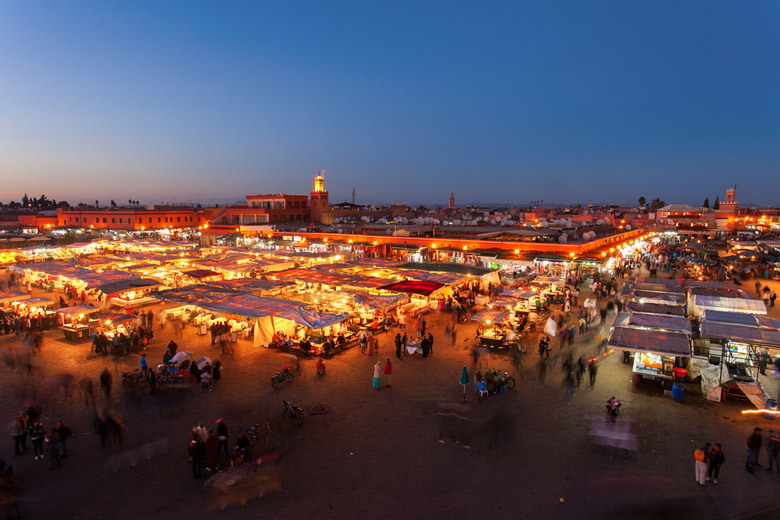 Even so, it is also a popular Marrakesh attraction for tourists too, presenting a different perspective on what life in the city would have been like hundreds of years ago. Even though El Badi Palace is in ruins, the grandeur is still easy to picture. Meaning “The Incomparable Palace” it was built between 1578 and 1593 and was constructed of the finest and most expensive materials of the time under commission of Arab Saadian sultan, Ahmad al-Mansur. But, when the Saadians rule fell, the palace was left to decline and was even stripped of many of its building materials and decorations. Be sure to explore some of the underground tunnels and also get tickets to see the beautiful 12th century restored wooden minbar as you enter the palace; it’s one of the museum exhibits, plus you can also visit the Photography Museum within the palace grounds. One of the other highlights of El Badi Palace are the views over the city. 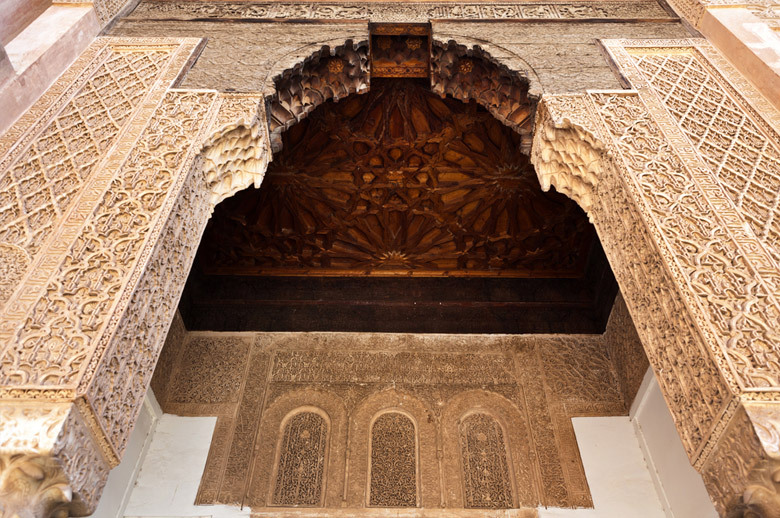 The intricate beauty of the Saadian Tombs really has to be seen to be believed. Dating from the rule of sultan Ahmad al-Mansur (1578-1603) this mausoleum holds around sixty members of the Saadi Dynasty including Ahmad al-Mansur himself and his family. Restored after being rediscovered in 1917, the tombs are now a major Marrakesh attraction, albeit a difficult one to find if you’re without a good map! Like a number of other things to do in Marrakesh, a visit to this attraction will only take up around 30 minutes of your time as it’s a relatively small site, but definitely worth the visit. The building has three rooms, the most famous being the room with the twelve columns, and large parts of the tombs are made of Italian Carrara marble while the intricate detailing that makes this such a beautiful place to visit is carved into cedar wood and stone. There is little in the way of explanation as to what you’re seeing so if you can hire a guide to show you around you will find out far more about the tombs, or research the site in detail before visiting. Hidden from direct sight, Bahia Palace is somewhat of a surprise discovery for anyone who visits this Marrakesh attraction. A welcome break from the bustling alleyways of the Medina, Bahia Palace is a beautiful combination of Islamic and Moroccan style architecture that was built in the late 19th century for Si Moussa, the grand vizier to the sultan. 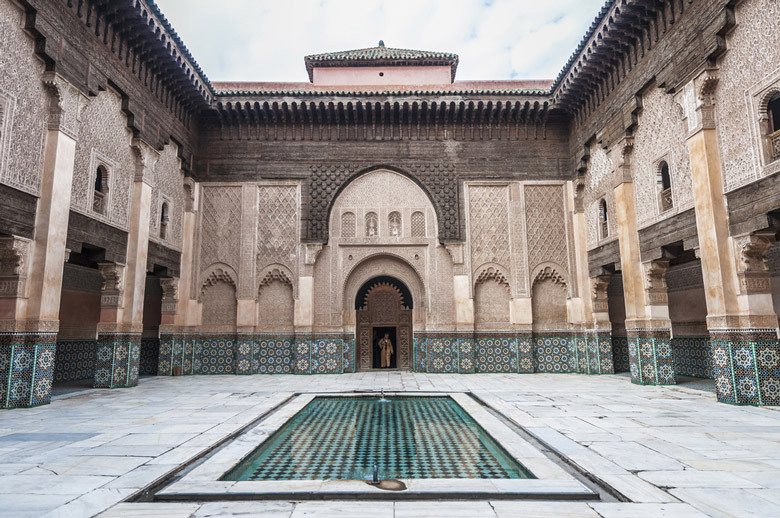 Adorned with intricate mosaic work both inside and within the expansive central courtyard, the palace can be toured without a guide, wandering from room to room admiring the painted ceilings and other decorative details. There is not a lot of explanation as to what you’re seeing so if you have the opportunity to explore Bahia Palace with a tour guide, take it and you’ll have a far better appreciation of the palace, its decorations and its uses. 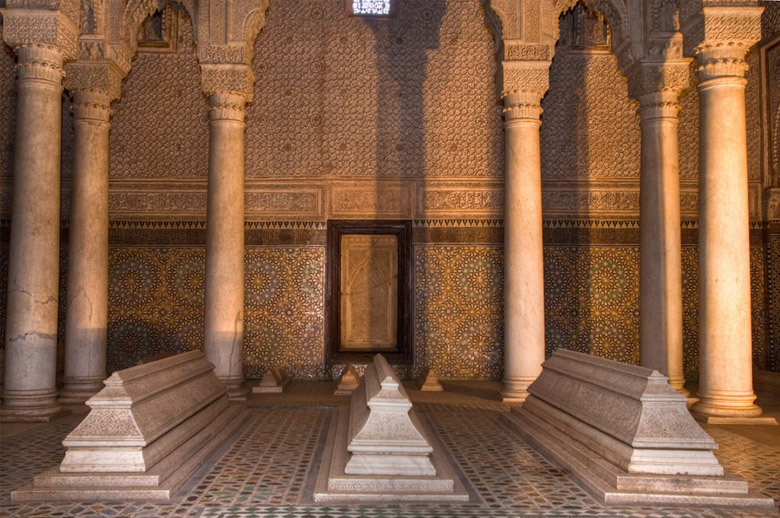 Meaning “brilliance”, Bahia Palace was certainly built to impress with its mosaics and detailing. The courtyard gardens are beautiful and offer some nice shaded areas to sit in and relax for a while, listening to the sound of the water flowing in the fountains. The gardens are especially nice in the spring when the numerous fruit trees are in blossom. If you can, try to visit before 10AM to avoid the arriving tourist groups. A “madrasa” is a word used in Arabic to describe a school or any other educational institution, be it for religious study or not. There are many hundreds of them dotted around the Islamic world in particular, but what makes these schools a tourist attraction? Well for the Ben Youssef Madrasa, which is one of the top things to see in Marrakesh, it’s the architecture that really impresses anyone who visits. Well maintained and preserved, the architecture of this former school is really quite beautiful and a prime example of the city’s Umayyad style of architecture. The madrasa has many lovely mosaics and carvings and gracefully combines a number of different building materials including stone and wood. This madrasa was an Islamic college and was named for the Almoravid sultan, Ali ibn Yusuf and was founded in the 14th century. 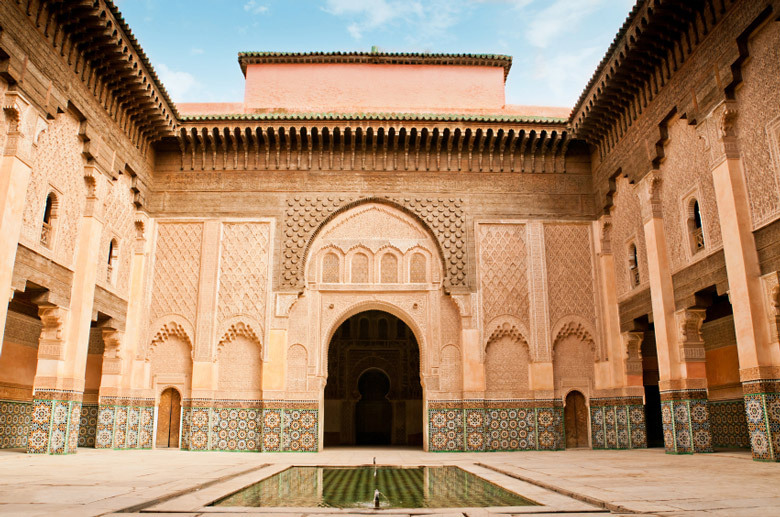 It remains the largest madrasa in Morocco and has 130 dorm rooms clustered around the beautiful central courtyard. The rooms, which are more like cells because of their small size, can be climbed into to get a real feel for what life was like when the school housed as many as 900 students. 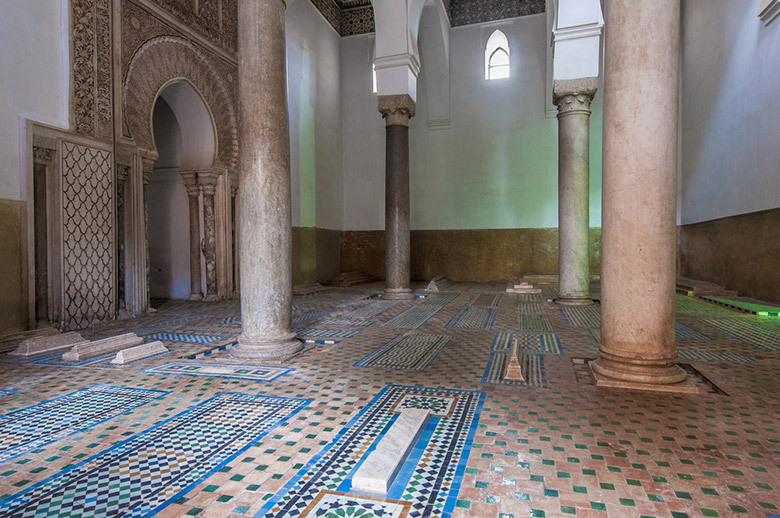 After closing in 1960 Ben Youssef Madrasa was renovated and opened to the public in 1982. 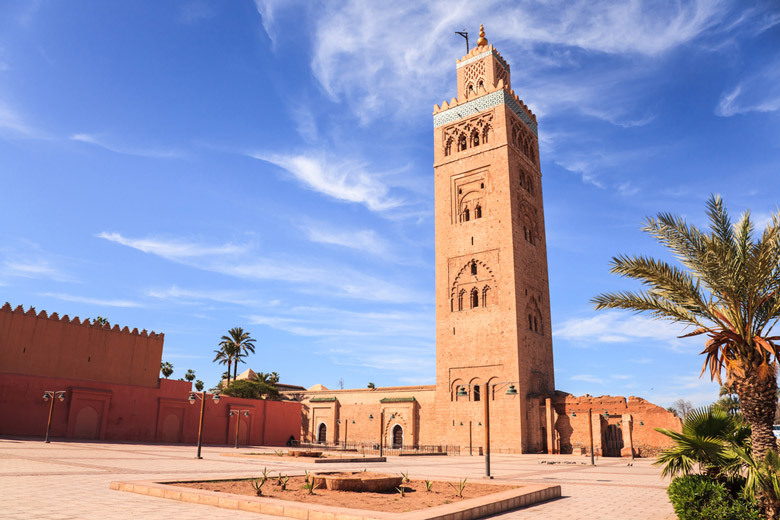 In a city full of mosques and wonderful architecture it’s easy to become blasé when you see more of the same, but Koutoubia Mosque stands out above the rest for several reasons and is definitely an attraction for your list of things to do in Marrakesh. For a start, Koutoubia Mosque is the largest mosque in the city and it was completed in the late 12th century so not only is it large, but very old. The mosque is still in daily use today by the local Sunni Islam population and can house several thousand worshippers at once. Technically the mosque is not open to non-Muslims so don’t expect large tours of tourists to be passing through, but if you visit any day other than Friday you may be lucky enough to be invited inside for a look and to climb the minaret. The minaret is a local favorite landmark, standing 77 meters (253 ft) high, and is visible from up to 29 kilometers (18 miles) distant. The beautiful Almohad style of architecture includes a band of ceramic tiles and Moorish-style arches. If you can’t go inside the mosque or minaret, spend some time relaxing in the attractive gardens that surround it. 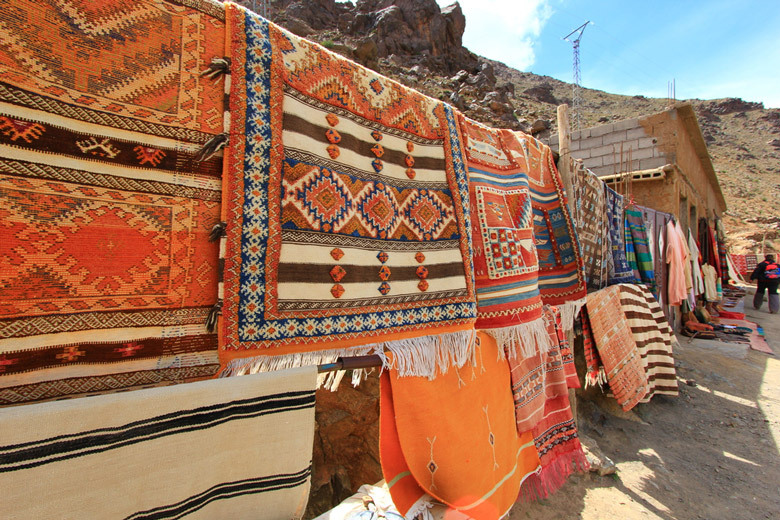 To truly enjoy a visit to Jemaa el-Fna you’ll have to just go with the flow! This busy and sometimes chaotic square is set right in the heart of Marrakesh’s Medina, but it most certainly needs to be on your itinerary for what to do in Marrakesh. Whether you visit by day or by night, Jemaa el-Fna will overload your senses with the amazing smells wafting through the square from the many food vendors, then there are the people – both locals and tourists – enjoying the atmosphere and the people-watching. As the main square of Marrakesh it has always been an important gathering place and still today Jamaa el-Fna retains its cultural importance as a place where people come to share stories, entertain the crowds with magic or music, dance or even charm snakes, so be sure to head right into the hustle and bustle of this square and spend time mingling in order to see and appreciate everything happening here. Evenings are the busiest times when the majority of food stalls open but you’ll witness an amazing place whatever time of day you visit. There are hotels close by if you want to stay in the midst of the Medina, as well as cafes and restaurants and of course the souks. When we say “Marrakesh Souk” we’re not really talking about just one place as the city actually has eighteen souks employing around 40,000 people in total. Within the narrow, maze-like streets of the Medina one souk merges into another, creating a bustling and noisy though always vibrant and captivating atmosphere that it’s far too easy to get lost in, metaphorically and literally! 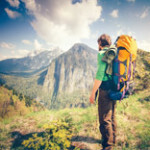 There are countless stores selling countless items as well as a plethora of tradesmen wandering around with their wares, or sitting within their small work spaces where they hand-make crafts and beautiful items, work metal over a blazing fire, or weave fabric. A visit to this Marrakesh attraction is like stepping back in time to the days when supermarkets didn’t exist and everyone shopped this way. 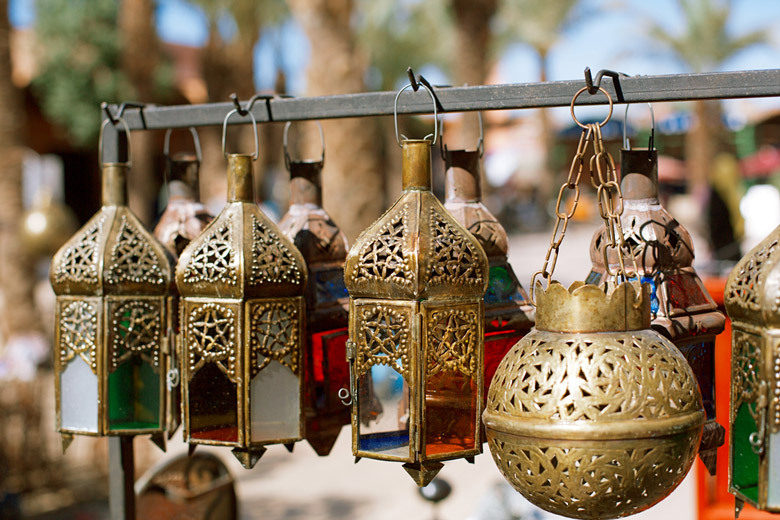 The funny thing is, many locals still shop for everything in the souks, even today, where haggling for a lower price is all part of the fun, and a firm “no” should get any vendor off your back. Despite it being a chaotic way to shop and one that may not appeal to everyone, the Souk has to be one of those places on your list of what to do in Marrakesh. 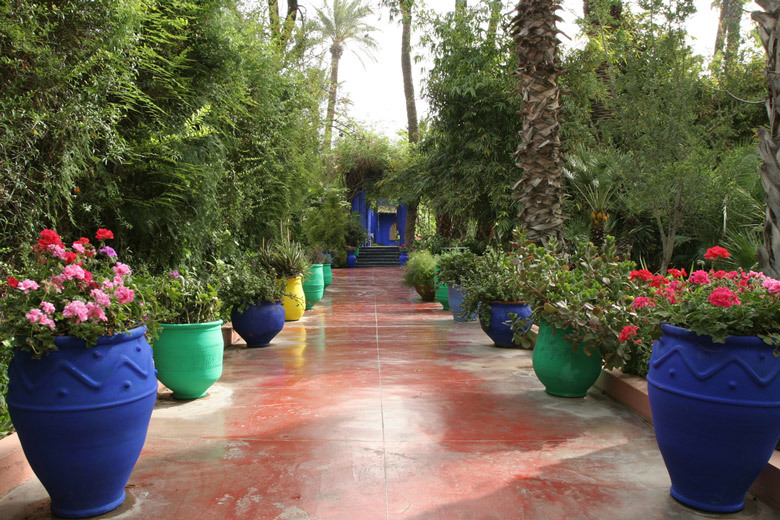 Whether you’re looking for a place to unwind after a long morning in the souks or you just love visiting wonderful gardens, Majorelle Garden should definitely be one of your top things to do in Marrakesh. Jardin Majorelle is set over twelve acres and while it’s most obviously a botanical garden, it’s actually far more than this. The immaculately kept gardens are complemented by the buildings and their amazingly vibrant shade of cobalt blue. The color, Majorelle Blue, was named after the garden’s designer, an expatriate French artist named Jacques Majorelle who designed the gardens, landscaping and buildings in the 1920s and 1930s. When you see the various plant species, including many cactus plants, standing against a backdrop of Majorelle Blue it’s quite the sight and keen photographers will get some great photos here. Visit this Marrakesh attraction as early as you can to avoid most of the crowds and for the best photos. The gardens start to get busy from as early as 10AM. If you’re also interested in art be sure to stop by the Islamic Art Museum of Marrakech which is also situated within the gardens and includes works by Majorelle as well as textiles from Yves Saint-Laurent’s own collection. The Medina of Marrakesh is undoubtedly one of the city’s greatest tourist attractions and it’s a part of the city that no visitor should miss. 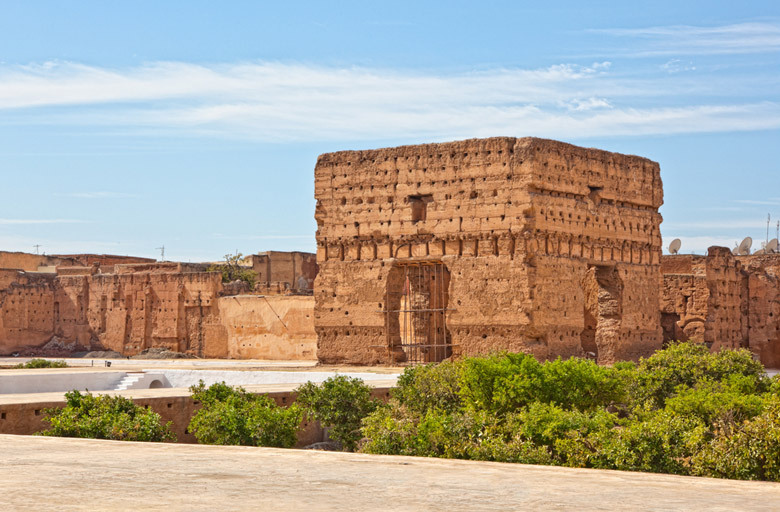 Meaning “old city”, medinas can be found in many North African cities and they date from hundreds of years ago. The Medina in Marrakesh is a magical place to explore and while a good map can help you to find your way around it’s sometimes fun to get lost in the maze-like, narrow streets. You never know what you might come across at the next turn! 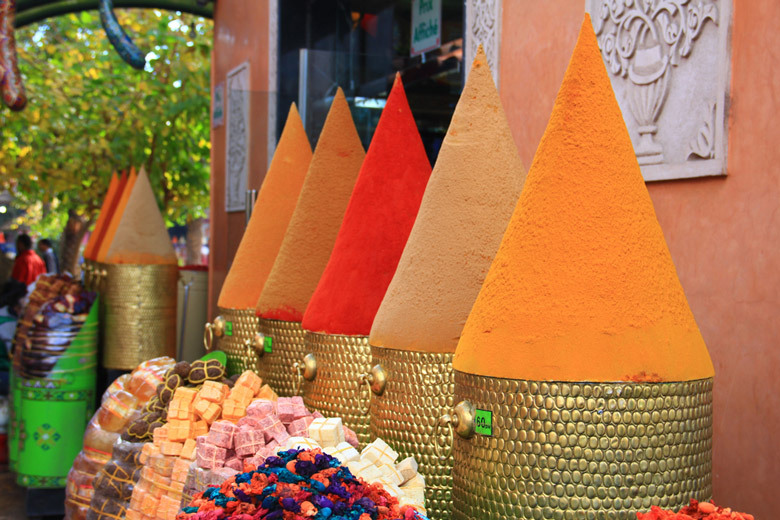 An assortment of sounds, smells, colors and sights, this top thing to do in Marrakesh will leave you wanting more, as just a few hours spent exploring this rabbit warren of streets won’t be enough. Stepping into the medina is like stepping back in time as the streets have barely changed since they were constructed. You’ll come across countless souks and probably cover miles so be sure to wear good shoes, and watch out for the crazy moped riders who dart out and across from everywhere! At the heart of the Medina is the large square named Jamaa el-Fna and it’s a great landmark to head for if you do get lost.